Purchased from Victor Franses Gallery, London. Emile Picault trained under Royer and exhibited a wide range of sculpture at the Salon between 1863 and 1909. His Egyptian subjects are some of his most popular works and follow in the tradition of ethnographical decorative sculpture in France during the latter part of the 19th Century. 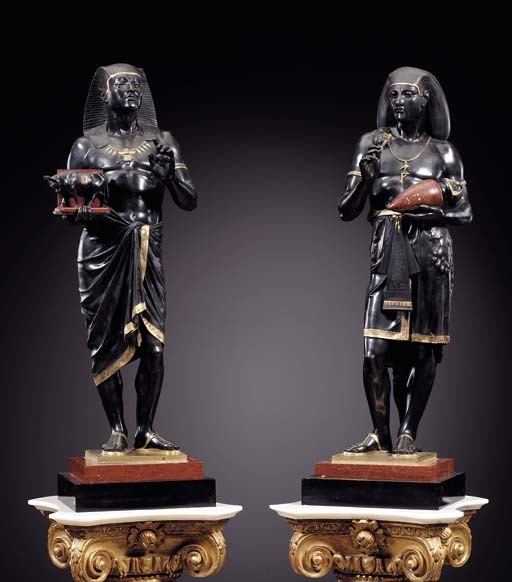 This pair of bronzes was probably cast by G. Servant, a fondeur with premises at 137, rue Vielle-du-Temple, who specialized in Egyptian Revival pieces and who was a medallist at the major international exhibitions between 1867 and 1887. An Egyptian Revival three-piece clock garniture in the same materials as the present lot and with a foundry stamp for Savant was sold anonymously, Christie's East, 14 October 1999, lot 339, and a single Egyptian figure by Picault and stamped with the Savant foundry mark sold anonymously, Sotheby's London, 29 September 1999, lot 262.